One of the biggest trends in consumer products is the increasing demand for natural products. This is particularly true in major categories like food and beverage, but it is also true in other product markets such has health and beauty products, personal products, and many other types of products. Even if your product is not consumable, the general public is demanding that companies manufacture their products in environmentally responsible ways. One of the best ways that a product manufacturer can communicate a commitment to environmental responsibility is at the point of sale. 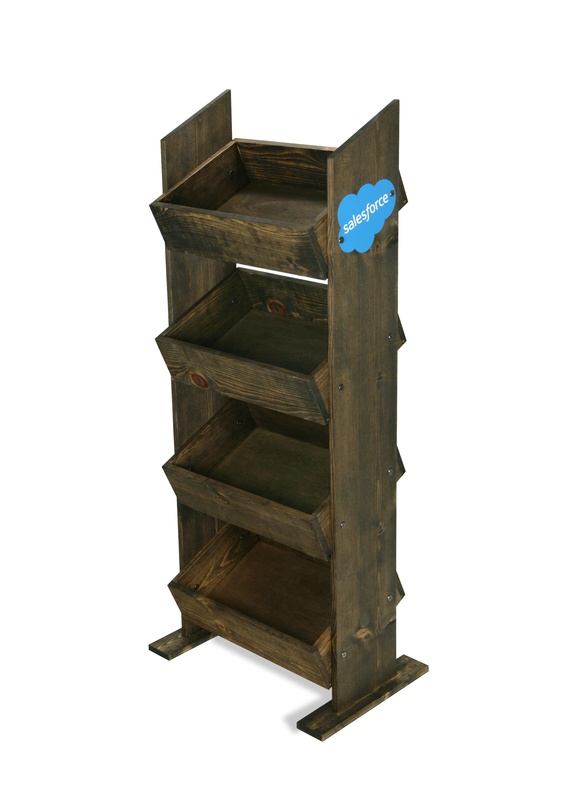 Merchandising solutions that are made out of solid wood are a great way for companies to reinforce the sustainability message. This trend is one of the reasons that wood displays are on the rise. In Part I of this 2-part series, we will share some recent examples of wood displays, all of which are domestically manufactured in our millwork operation in the USA. Most of the examples are relatively simple displays that can be used for a wide range of products. Despite their simplicity, all of them help to communicate the “natural” message, particularly when it comes to alternative displays that are made of sheet metal or plastic. We’ll show some example of raw unfinished wood and other examples of various stained wood displays. Any of these displays can be dressed up with additional signage or modified to fit different dimensions and product configuration requirements. Let’s take a look at some recent examples of wood displays from our shop. 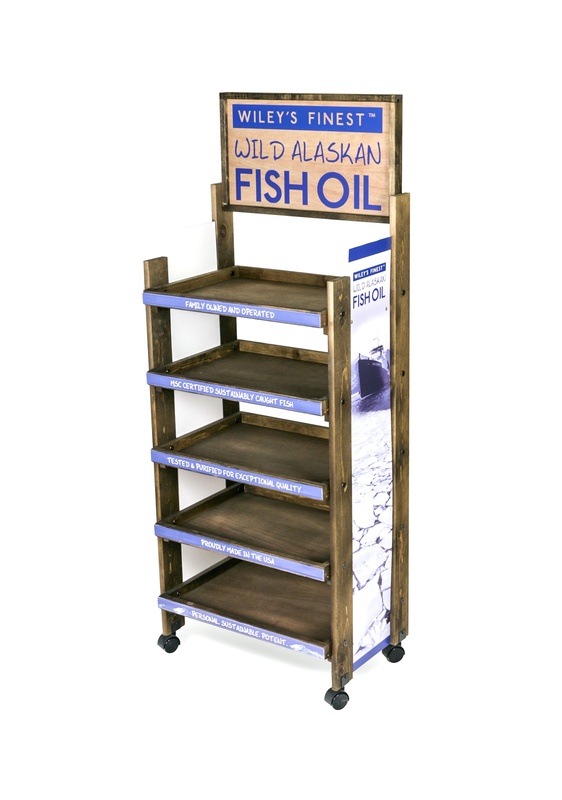 First is a narrow version of a wood display we designed for Wiley’s Finest which makes a Wild Alaskan Fish Oil product. 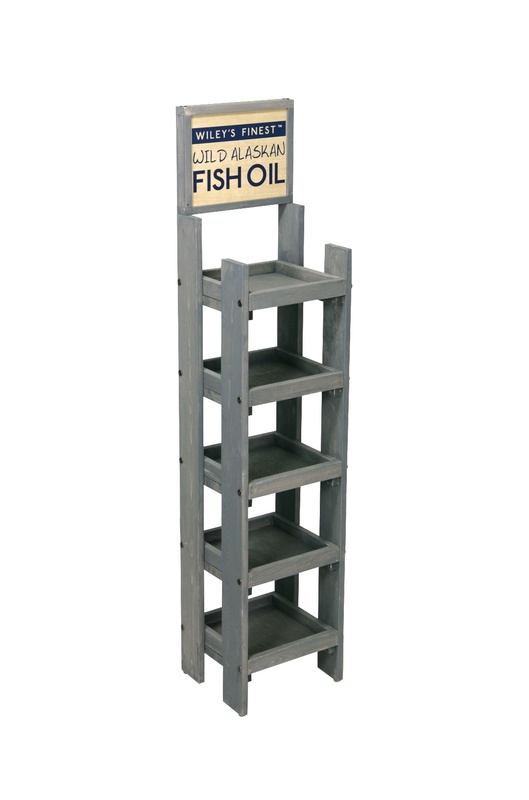 The “natural” aspect of the company’s product is a hugely important part of its consumer message so the solid wood shelf display with a grey wash finish not only looks nice but really supports the company’s product positioning. In a previous post we shared the larger version of this display, and we’ll share it again here to show a different stain finish and how a display like this can accommodate side signs for additional branding. Next is a display we made a few years ago for Cardinal Pet Care, a solar powered company devoted to pets, people, and the planet. 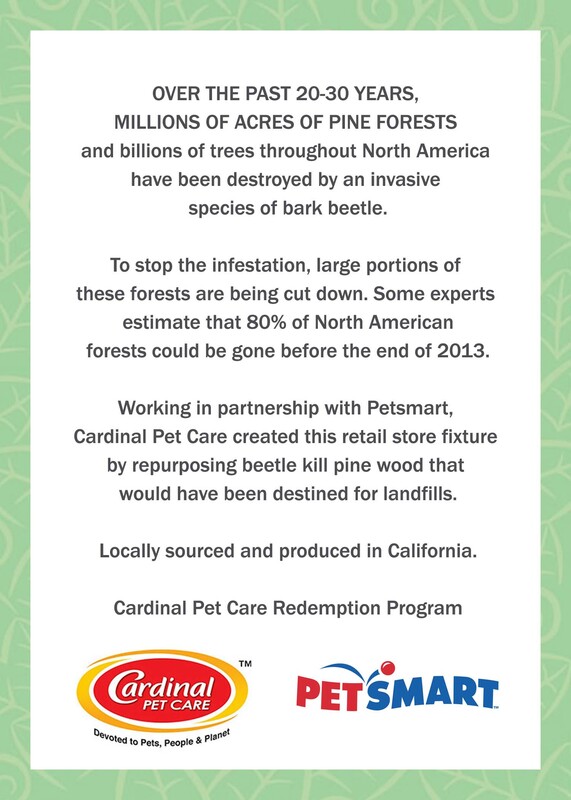 We made the display shown below out of Beetle Kill Pine for their Pet Botanics brand to go into PetSmart stores. If you don’t know the story behind Beetle Kill Pine and if you are interested in seeing some cool examples of what you can do with Beetle Kill Pine, check out the blog we devoted to subject: The Next Big Idea in Retail Merchandising: Beetle Kill Pine. The message on the side signs helps to tell the Beetle Kill story. 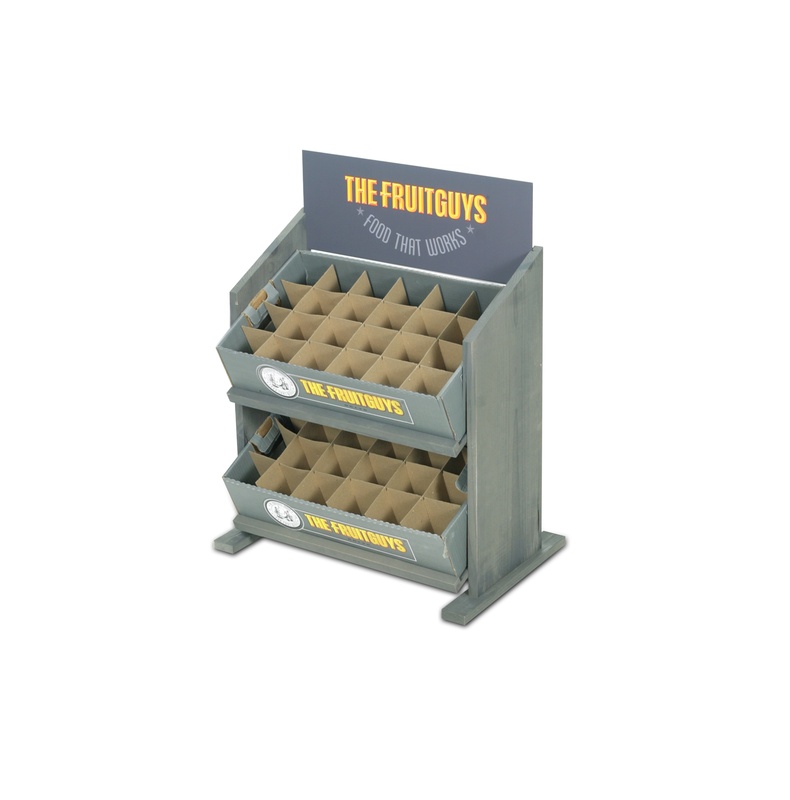 Our next few examples are various wood displays we made for The Fruit Guys as a part of their worksite fruit service that they make available to employers who want to offer their employees healthy snack alternatives to the kinds of snacks you typically find in vending machines. 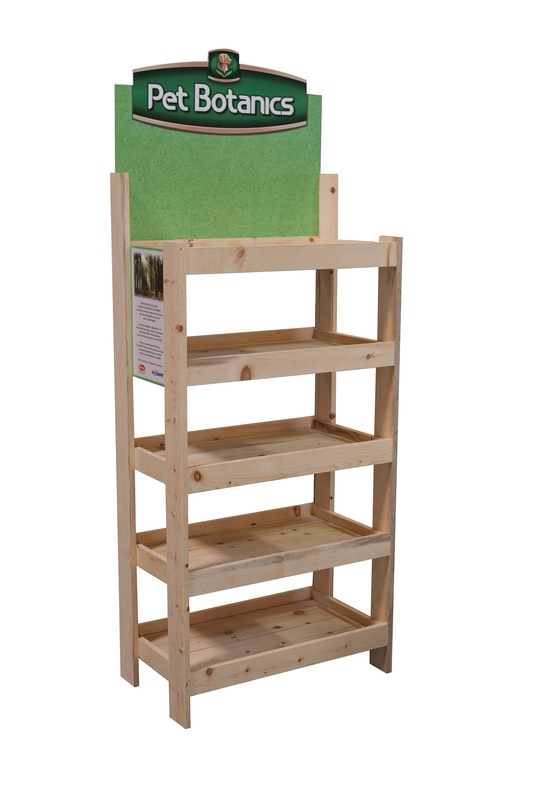 With this kind of product offering you can see the importance of providing a natural merchandising vehicle to complement their healthy product offering. 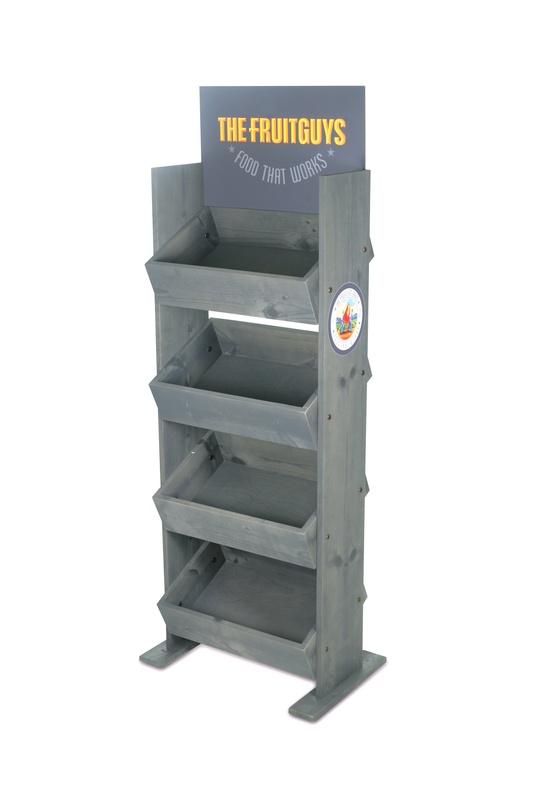 We created various styles of wood displays with shelves and with bins and provided different wood stain options, as well as the flexibility to have The Fruit Guys branding or customer branding. 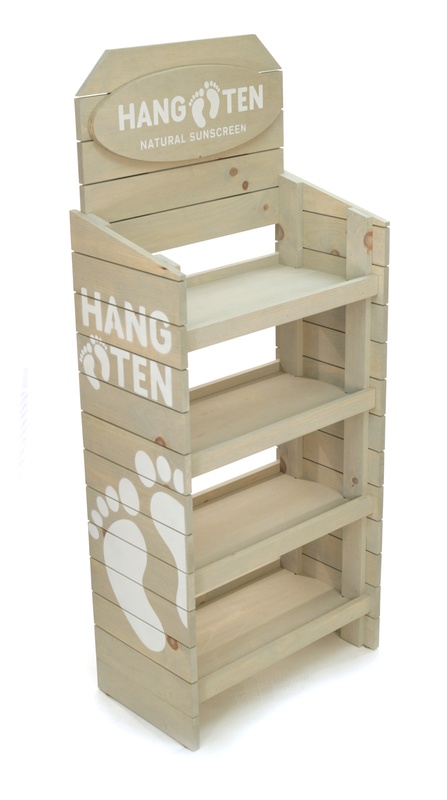 Our second to last example is a natural solid pine display we made for Coola’s brand of natural sunscreen called Hang Ten. Coola is a lifestyle brand so we wanted to use wood to communicate the natural message but also added cool stenciled graphics on the header and sides to communicate their brand. We used a light wash on the pine wood rather than a stain which provided a look that resonated with the company’s brand image. 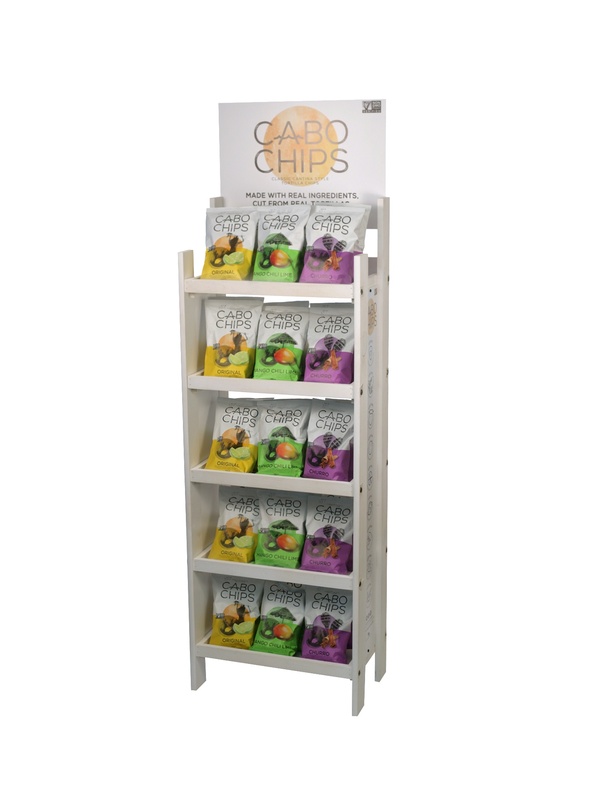 Our final example today is a simple wood shelf display we made for Cabo Chips. As we mentioned at the top of this blog, wood displays are very popular in the food and beverage arena these days, and the Cabo Chips display is a good example of a simple wood display that has good holding capacity, a light white washed finish to match their packaging, and a basic PVC header sign to talk up their brand. 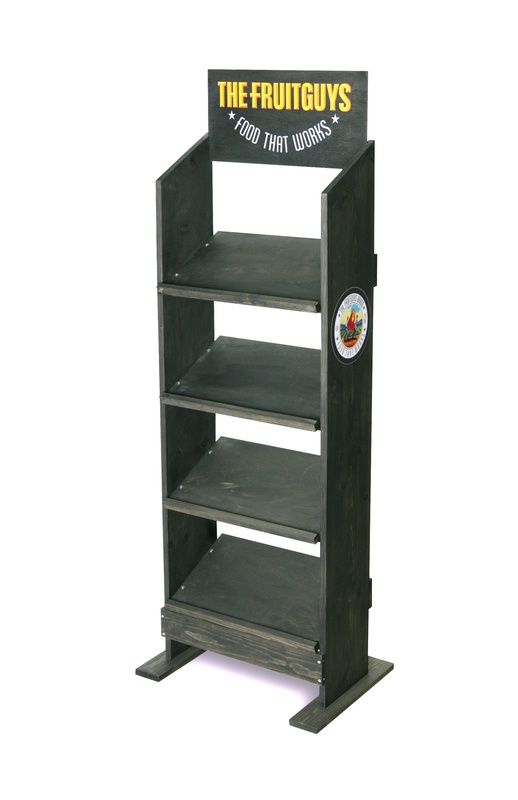 This display is also nice because it is cost-effective, knocks down flat for shipping and is easy to assemble. That’s it for today’s blog, but be sure to check out Part II of this series where we will share 11 more wood displays that can help your brand communicate the “natural” and “sustainable” message that so many consumers are embracing.